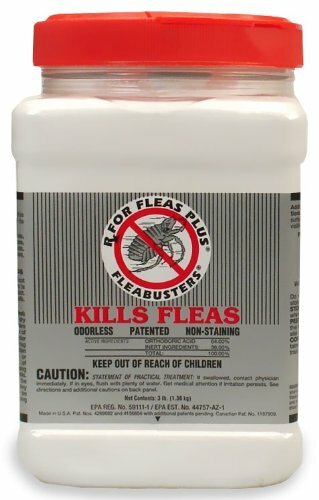 PRODUCT DESCRIPTION: Fleabusters® Unique Borate Flea Powder Has Many Important 'Flea-Killing' Features. The Rx for Fleas Plus powder is milled to be extremely fine and is also statically charged. The 'fine' powder allows for easy installation while brushing into the carpet and for light application (very small amounts need to be applied for effectiveness). The 'statically charged' powder provides a clinging effect to carpet fibers. This allows very little to be removed by vacuuming, thereby providing long-lasting protection. It attaches to the flea larvae as they wiggle by. The effectiveness of killing (dehydrating) flea larvae is greatly increased. The Rx for Fleas Plus also has a neutral pH of 7.0. While being very safe for carpets, the neutral pH is actually more important in a pest control sense by not causing the targeted pest (flea) to be repelled from the powder. Roaches, ants, fleas, etc., can sense and avoid an alkaline or acidic substance, but crawl right through the neutral pH material. RATE OF APPLICATION: The Fleabusters label identifies the maximum allowable coverage for the container size (3 lbs.). This means in 900 square feet you can't use more than 3 lbs., but you can use less! Fleabusters service company averages less than 3 pounds of powder to treat the average home of living room, halls, stairs, family room and 3 bedrooms – five average size rooms! Because the powder is so fine it only requires a small amount applied everywhere to be effective. More is not better! Only a few microscopic crystals are all that's necessary to kill the flea larvae.